(Newser) – Google's iconic bare-bones front page is seeing a notable change today: For the first time, it carries an animated banner ad, Mashable reports. 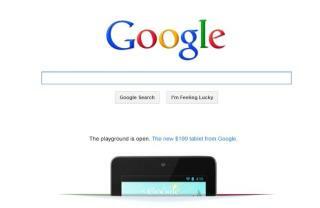 The image shows the top of Google's own Nexus 7 Android tablet. The page has hosted advertising before—for the Nexus One smartphone, for instance—but that was just text and an icon. The new, large ad comes six weeks after Marissa Mayer, who oversaw the simple Google homepage, departed the firm for Yahoo, notes Mashable. Google is starting to show ads? What is the internet coming to?